Welcome back to the final term of the year. 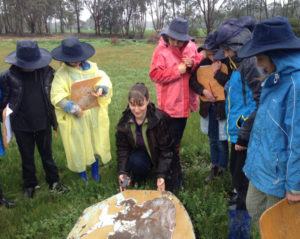 Winter seems reluctant to leave us this year, but it is marvellous to see the school grounds and surrounding bush so green and alive, and to experience the water rising and rushing through the creeks. It is wonderful to have all the children back in the school this week. The highlight of this term is, as always, the beautiful Spring Fair. Preparations are at full steam and I thank all of you who are planning and making and organising for the day. It is such an important time for the children to experience the whole school community coming together and working with them to create such a joyful and fun event. I look forward to seeing you all there as we celebrate our year together. Welcome back to Kinder and welcome to our rainy first day back. Oh how it has rained! We have commenced our first day with our Spring Cleaning Morning Circle, but towards the end of the week we will be singing about the rain in Morning Circle. There will be lots of splishing and splashing to muster our enthusiasm for all this wetness at present. Thank you for such a delightful festival and your appreciative feedback. It was a real treat to have our Eurythmist, Nicole, leading us in the Circle. 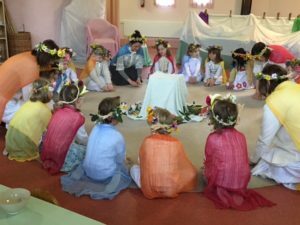 I am delighted you could all share in the joy of Eurythmy with the children. They are so enlivened by it. Looking ahead towards the term, it is quite busy! We will have Transition Reports being sent home soon (these are Department of Education documents that provide information to Prep teachers to help in the transition to Prep); there will be Parent Teachers Interviews (to discuss the Transition reports); there will be a meeting in the coming weeks for Kinder parents to meet with Heather, our Prep teacher; we will have some visits/plays in the Prep Room/Yard towards the end of term; and we will be enjoying our last term together as a Kinder family. I will send home a note soon with these dates included. I will also be sending home some information about how we will be tweaking our morning entering routine starting next week (Week 2). Throughout the term we will do some Christmas baking and so much more. I am so looking forward to our last term together. Already this morning the children have entered the room filled with enthusiasm to play and be together – it is such an inspiration to see them so involved in their play. NB: New menu for Term 4 coming soon. Wash the earth all clean again. We have certainly had an abundance of ‘springtime showers’! I do hope everyone had a relaxing and enjoyable holiday. The children returned very calmly and easily slipped back into our Prep rhythm. Thank you to everyone for sharing our Spring Festival with us and helping to create such a special experience for the children. Next Tuesday 11th October, Ron and Sarah will be visiting Prep. Ron will play the didgeridoo and we will hear a story and learn some Aboriginal dances. Our Spring term has begun with much enthusiasm in Class One and we are excited about our two new baby guinea pigs! We have begun with skipping , Form Drawing of running forms as we follow the King to find his Queen, beautiful writing, and lots of fun in the mud and puddles left by the Spring rains. Class Newsletter out early next week. The children were eager to settle in and begin our exploration of money and commence trading in our Penny Wise’s shop. Over the next two weeks I am sure you shall hear about the little treasures to be found there. This week we welcome Helen back into our classroom on a more regular basis to offer extra support. Please set aside Tuesday 18th October to attend our Class Meeting at 7:30 in which Libby from our Music Faculty will discuss our instrument program which commences in class three. It is important that a representative from each family attends so that guidance can be given regards choosing your child’s stringed instrument for next year. We have started the term full steam ahead practising our play. The children were still in holiday mode at the start of the week, but they are now wide awake and focussed. They are very excited sharing their stories of their Building projects and on Tuesday we all sat around and the children shared their stories of their struggles and challenges along the building path. It was great for all the children to see that they are not the only ones to have trouble along the way. The building project and the write up are due on Monday morning. Don’t forget out Class Meeting is scheduled for next Wednesday night at 7.00pm. We will discuss the sleep over and the camp. Back we come to our last term of Class 4 as if we have never been away, though the holidays have all been used fully by the children by all accounts. Wonderful animal creations from the animal project have also arrived, proving how busy the class has been over the break. This term we start off with a main lesson on The History of Writing, exploring the very beginnings of humans expressing themselves by making marks on cave walls and rocks, with those marks developing into alphabets being scribed onto paper. We have lots of practical experiences ahead. Whilst the rainy weather is with us, please ensure that your child has a spare change of clothes and waterproof boots and coat – especially on Fridays. What a wet and wild wintry spring to begin Term 4!! This week Class 6 are continuing with their Geometry of the Circle Main Lesson creating intriguing leaf forms and learning more complex divisions of a circle. There is much excitement as we prepare for our Horse Riding Camp next week. The venue is a wonderful place in the Barmah Forest bordering the Murray River with a pair of exceptional riding instructors. Here’s hoping the weather will be kinder next week. I can’t wait to hear more stories upon their return. We invite you to Knit a Square for Youth Homelessness! We plan to knit a blanket to raffle at the Fair – and donate the funds to ‘Front Yard’, the Youth Homelessness Support Service of the Melbourne City Mission. A memorable aspect of our recent City Camp was our visit to Front Yard and it really opened our eyes to the experiences of young homeless people in Melbourne and to the wonderful work that is being done to support them. Each blanket square only needs to be 20cm by 20cm – in any wool, any colour combination (go crazy!). We have three weeks to complete it – and so far we have THREE SQUARES! (Because I knitted them last weekend). Wool, needles and instructions are available at the office … or feel free to knit up any oddments you might have. We may even end up with enough squares for one blanket to raffle AND one to donate! Welcome back everyone. This term is huge for the Craft Program, beginning new projects and working towards completing them without rush, haste and undue stress. Slow and steady is my motto for Term Four. This year I am holding an Art and Craft Exhibition opening on Spring Fair day, and running through to the following Wednesday 9th November. The exhibition will be open from 9am to 3:30pm, Monday 7th to Wednesday 9th. I am hoping to invite as many Craft Groups as possible to share and celebrate the work created by our Children. I have a brochure and introduction letter I am sending out to as many Craft Groups, Magazines/Publications, interested individuals etc. If you have any contact details for any of the above: Craft/Arts Groups or interested individuals, please drop their details in at the office and I will send them out this week and next. I really need your help to brainstorm who I can invite. 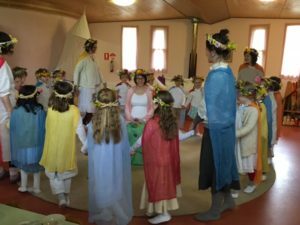 A little over three years ago, Eurythmy was certainly not a strong point in the school program; now it has grown and developed over the years, and students are apt in many capacities they would not have even conceived of before. They joyfully move all manner of spatial forms, paint imaginative sound pictures through gestures, deeply listen to music and poetry, and have created the substance for performances and festivals as was broadly witnessed at last years Petyan Festival. Eurythmy is said to be one of the essential subjects that makes a Steiner school “Steiner”, and indeed Steiner himself wrote of it as the heart of this new education. I don’t at all mean to toot my own horn! So many people do excellent and essential work here that makes this place what it is. 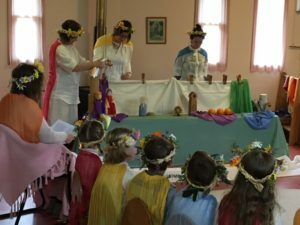 I am simply humbled and in awe of the changes that have been seen in the students directly in Eurythmy, and in other more subtle ways across the school, since having this awesome task of bringing Eurythmy into the culture here. There is not much that could take me away from this work! There is one thing however, and for that, the time has indeed come for me to move onto a whole new primary occupation (for a while), and that is: Motherhood! I am expecting my first child, with my wonderful man, in early April next year. Because of this, I will no longer be teaching Kindergarten to Class 2 this term, however I do hope to have the energy to continue with the other classes and be able to share their work with other classes and/or parents and friends in the coming term. I look forward to a special last term together and so far, the few classes that I have seen, have come back full of focus and interest for our final term together. Our first performance dates will be released shortly. Bienvenue and welcome back to the final term for the year as our calendar quickly fills with interesting activities! Our French students will be busy for the next couple of weeks with camps in lots of exciting destinations … but along the way we will be factoring in a new game, Faisons Ma Valise, which looks at the vocabulary for clothing, seasons, and packing for a holiday. Some of it may even be useful for packing those bags for camp! In the coming weeks, Class Six will explore the basics of letter writing as an introduction to talking about themselves in simple sentences. Classes Seven and Eight will return to the cooking sessions that were suspended due to our experiences in the recent floods … and we may even have time to write some responses to our Class Six letter writers! At the end of last term we had a visit from Asher from Connecting Country who had been conducting reptile monitoring in our paddock. The process is to place a terracotta tile on the ground (with a stick underneath to give a little critter the space to get under) and come back some months later to see if anyone has moved in. Armed with data sheets, Class Four accompanied Asher out to the paddock in the rain. What we found were worms, lots of them! 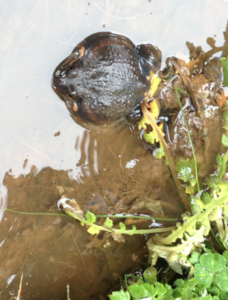 We did look under a piece of chipboard and found a beautiful pobblebonk frog. Welcome back families and friends! I hope you all had an enjoyable and restful holiday, whilst managing to stay fairly dry. Just amazing how much rain we’ve had. As I type this though, the sun is out for the first time in what seems like months and it is lovely the energy and enthusiasm that it brings forth. A sign of some beautiful days ahead over the next month or so before it gets hot again! With all the camps and activities over the first few weeks of Term 4, Physical Education will have a rather interrupted start to Term 4. In Class 5 I am however very much looking forward to some Greek Olympics practice sessions before the big day on Wednesday 9th November when we host the games. I am very excited and blessed to have this wonderful opportunity so early into my teaching life here at our amazing school. I wish you all a fantastic Term 4. Looking forward to the Spring Fair which is fast approaching. Enjoy the sunshine, but don’t forget to be sunsmart! Welcome to Term 4! There’s already is a buzz of activity around the Parents Room as we prepare for Spring Fair and the Spring Festival that was postponed due to last month’s flooding rains. We’re also continuing our Wednesday morning get togethers. Come along for a cup of tea and a chat anytime from drop off until lunch time. Across the term we’ll be hand-dipping birthday candles, rainbow dyeing felt and finishing off our Lady Spring dolls and our wet felted needle cases. The Craft Group will also be getting together each Monday after assembly to prepare kits for Spring Fair and dye some beautiful silks. Kits to take home to sew or knit for the fair are available from reception. Lastly, the Parents & Friends Group has been provided an opportunity to fundraise through the sale of Alter Eco organic and fair trade chocolate. We plan to use the money to improve the school kitchen, the parents room sandpit area and to establish a “take a book, leave a book” library. The chocolate is available for $4 a bar or $20 for 6 bars. You can expect to pay about $5.50 a bar for this chocolate in shops. We’ve done quite a bit of testing and can confirm it really is very good! The Dark Blackout makes a fabulous dark cooking chocolate. The chocolate is available for purchase from Reception or contact me (0420 318 255 or julie.tisdale@gmail.com) or Aleesha (kinder, class 1 and 3) if you want to make other arrangements. In line with the school food policy, we won’t be selling the chocolate for children to possibly eat at school. If you’d like your child to pick some up for home, please contact the office to authorise this. Below an ex-student of the school is looking good! Magpie was the Prep sheep a couple of years ago and is flourishing in his new environment. Under school policy we cannot sell the chocolate to children unless parents call or email the office. We will sell it to them at the end of the day only. We’re looking for a full-size cello in good condition for Joshua. David Mandara on 5348 4145. Opens Friday 7th October 7pm at Theatre Royal. 11 sessions over 3 days. Term 4 enrolments are being accepted for children aged 7-12. Classes start October 15th and run each Saturday from 10.30-11.15am at Castlemaine Senior Citizens Centre.